There are various ways you can travel to The King’s Centre, Oxford, for CiS events. It is possible to drive and park at the centre, but we would encourage you to help reduce the ‘carbon footprint’ of our event, and the congestion of traffic in Oxford, by using alternative means of transport if that is possible. Full address: The King’s Centre, Osney Mead, Oxford, OX2 0ES. 1. Drive: parking at the centre is reasonably limited so it is best that not everyone drives. However, if you do need to, there should be space, but do let us know if you intend to park at the centre. For sat-navs, use the postcode OX2 0ES. Come off the A34 at the Botley interchange, turn left at McDonalds and down the Botley road. When you reach a set of traffic lights at a bridge, take the feed right onto Ferry Hinksey road onto the industrial estate. Pass the primary school, and turn left at the mini roundabout. TKC is on the left a little way down, just past the fish market and opposite the Oxford Mail. 2. Park and Ride: this is an ideal solution if it’s easiest for you to drive, but you do not need to park right at the centre. Seacourt park and ride is just off the A34 on the Botley road (OX2 0HP). Parking here costs ~£2 for the day, and you can get the bus to the Osney Mead bus stop, coming down the Botley road (this is a good way to avoid the Saturday traffic too, with the clear bus lanes!). Once off the bus, cross the road on the bridge, and take the footpath bridge across onto Osney Island, and walk along the front of the houses, along the canal. Pass the lock, and cross a bridge over the canal. At this point TKC is in front of you – turn right down the side of the centre (rather than carrying along the tow-path) and enter through the side gate. 3. 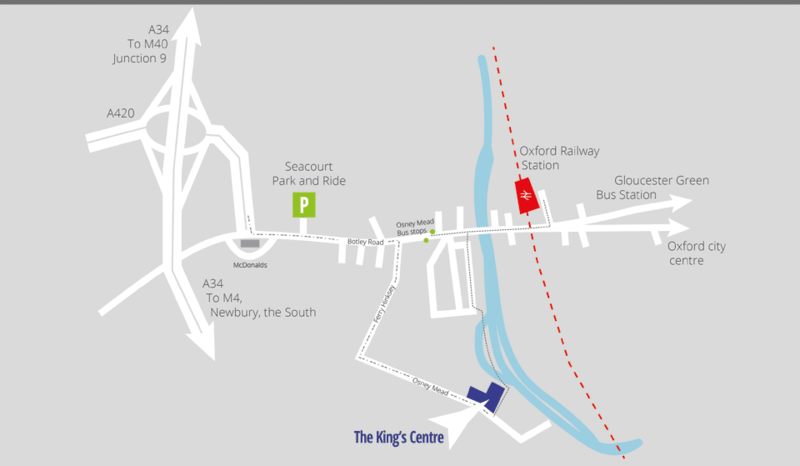 Train: The King’s Centre is only a 10-15 minute walk from the train station, so an ideal place to get to via train! When you leave the station turn right and go under the train bridge. Keep walking until you cross a hump bridge over the river/canal. On this bridge is a footpath turning left onto Osney Island. Walk along the front of the houses, along the canal. Pass the lock, and cross a bridge over the canal. At this point TKC is in front of you – turn right down the side of the centre (rather than carrying along the tow-path) and enter through the side gate. 4. Cycle or Bus: If you are local, please do cycle (acessible along the tow path, or through town past the station) or get a bus that travels along the Botley road! There are secure and sheltered bike-racks at the centre.